Church building description: Mostly C15 with some C12 stonework. Some medieval stained glass. Rector Benjamin Suckling was a cousin of Nelson. Modern paintings based on the Ranworth screen. The church is now informally part of a group of 10 parishes. 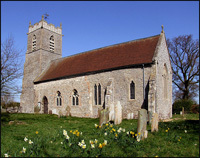 This church is in the Parish of Plumstead, Matlaske Benefice and the Holt Deanery.